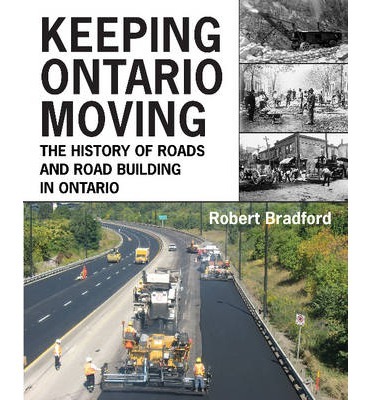 A comprehensive history of roads and road-building in Ontario. In this beautifully illustrated book, virtually every facet of the road building industry in Ontario is discussed, from labour relations to safety, politics, and financing. Follow the history of road-building technology from the first crude trails hacked through dense forests by homesteaders to the corduroy roads, planks roads, stone roads, macadam pavements, hot mix asphalt pavements, and concrete roads. See how the engineering and construction of bridges has progressed from the first jack pine logs placed across a stream to the complex structures that span international waters and thousands of rivers today. Follow the development of construction equipment from the first steam shovels and cable-operated machines of the late 1800s to diesel-powered machines in the 1940s and later hydraulics. Meet the companies that made the equipment and the people who sold and rented it. From the 1930s forward the early story of roads is told largely by the people who lived and made the history. Over 120 contractors, engineers, government officials, and others were interviewed and the last eighty years of the industry s history unfolds in the way they remember it. Share their memories and stories, some hilarious and some tragic, as they talk about their projects, their businesses, their successes, and their hardships."